Select the message and drag it to the destination folder. Select the message that you want to copy. On the Home tab, click Move > Copy to Folder. Start typing the name of the destination folder. When the folder you want appears, click the folder name > Copy. 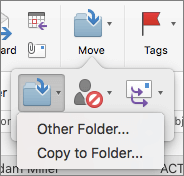 Tip: To create a new folder in the sidebar, hold down CONTROL, select an existing folder > New Folder.